Our pleated skylight shades in light filtering fabric are ideal for energy savings while still allowing filtered light to enter the room. Each skylight shade opens with minimal stack for maximum view-through. These light filtering window shades are designed with no holes privacy so there are no holes in the front of the fabric through which light can penetrate. Skylight shades are great energy saving blinds by reducing heat gain by up to 50% in the summer and reducing heat loss by up to 40% in the winter. Minimize fading of carpets and furniture due to reduced uv rays. 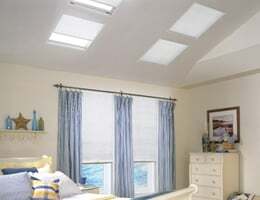 Skylight Shading Systems are for inside mount applications only. Hardware and cords come only in off-white. The widest width of the window cannot exceed the narrowest width of the window by more than 3/8”. These shades for skylight windows are cordless and may require a pole to operate in hard to reach windows. Production time frame is at a minimum of 12 business days. Purchased for slanted ceiling skylights. Purchased for slanted ceiling skylights. They work better than expected for light filtering without making the room too dark. Installation was fairly easy for such a difficult area to install. Size was perfect based on our measurements. The blinds were easy to install, a little scary since I have 16' ceilings. The blinds were easy to install, a little scary since I have 16' ceilings. I am really happy with the appearance of the room. I would definitely recommend, great product! The best part is that my leather furniture will stop fading from the sun. I think you should note that the headrails are white -- not the color of the shade. Our 12 foot expandable extension pole pole allows for easy operation of hard to reach cordless window shades. Our 6 foot expandable extension pole pole allows for easy operation of hard to reach cordless window shades.